← y carnt danyul rite? 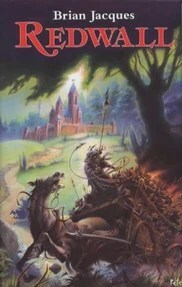 This entry was posted in General and tagged Brian Jacques, Brian Jacques Tribute, Redwall. Bookmark the permalink. I find myself at a loss when it comes to deeply personal posts like this. I want to say something, but can’t really add much when the comment above sums up my thoughts perfectly. I will say, however, that I think passing the man’s works on to be read by a new generation is the finest tribute you can give him.